It's the age old building with a brand new face. Brisbane's centrepiece, City Hall, was welcomed back by local government officials in a stunning opening that reinstated council at 'home'. It’s the age-old building with a brand new face. Brisbane’s centrepiece, Brisbane City Hall, was welcomed back by local government officials in a stunning opening that reinstated council at ‘home’. The epic restoration cost $215 million and took more than three years to finish. LOUD events was appointed to deliver the event that entailed a three course sit down dinner provided by new players in the Brisbane market, Epicure. The black tie dinner was held for more than 600 corporate and political heads and utlised a new smart phone silent auction system that included items such old City Hall plans and commemorative pieces. All monies raised went towards the Lord Mayor’s Charitable Trust supporting the blind, homeless and those suffering with mental illness. The event brief focused on highlighting the 4322 organ pipes of the 119 year old organ. LOUD director, Helena Marshall said the event signified the opening of the largest restoration project ever undertaken by a local council in Australia. “Working in a new, old venue presented a number of challenges. None of the serveries are yet complete, providing hurdles for the new contractors, Epicure to overcome and limiting access points. However it was a stunning evening showcasing the pinnacles of the room, the organ and the LED dome made of 8,500 LED lights,” she said. LOUD events is owned and operated by Helena Marshall and Marianne Edmonds. These ladies were fortunate enough to work very closely with each of the stake holders and LOUD’s amazing in house team of carpenters, steel workers, large format printers and “public event” account managers to deliver the fine details of the event. “We are extremely proud of our team and all of the hard work they put into this project and are privileged to have had the opportunity to work with the council on this project,” Marshall said. 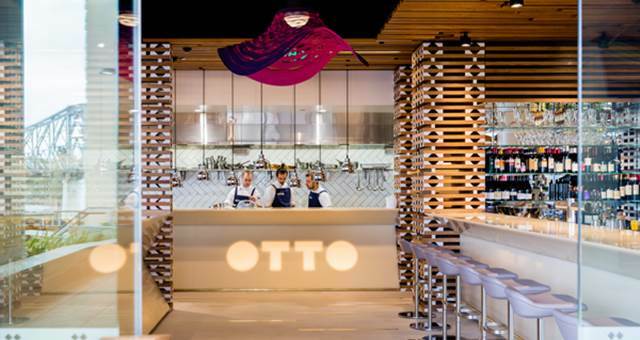 The sunshine state now has an Otto Ristorante.